This article is about the road. For the rail disaster, see Ladbroke Grove rail crash. 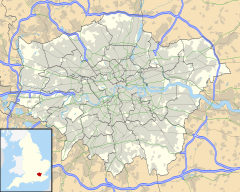 Ladbroke Grove (/ˈlædbrʊk/) is a road in west London in the Royal Borough of Kensington and Chelsea, running north–south between Harrow Road and Holland Park Avenue. It is also a name given to the immediate surrounding area of Notting Hill and Kensal Green, straddling the W10 and W11 postal districts. Ladbroke Grove tube station is located on the road, at the point where it is crossed by the Westway. It is the nearest tube station to Portobello Road Market. The adjacent bridge and nearby section of the Westway (London) were regenerated in 2007 in a partnership including Urban Eye, Transport for London and London Underground. 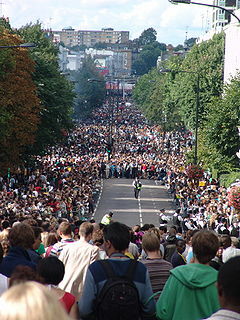 Ladbroke Grove is the main road on the route of the annual Notting Hill Carnival. The northern tip of the road is located in Kensal Green, with the southern end in Notting Hill. The street is named after James Weller Ladbroke, who developed the Ladbroke Estate in the mid-19th century, until then a largely rural area on the western edges of London. Hablot Knight Browne, the cartoonist who illustrated Charles Dickens' novels as "Phiz", lived at No. 99 in 1872-80. The Anglican church of St Michael and All Angels in the road was designed by James Edmeston and built in the Romanesque style in 1871. The Serbian Orthodox Church of St Sava is on Lancaster Road, just off Ladbroke Grove. The church building was originally built in 1903 as the Anglican church of St Columba; in 1952 it was re-consecrated as Saint Sava's, to serve a growing community of post-war refugees. It was the venue for the baptism of Alexander, Crown Prince of Yugoslavia, son of Peter II, in 1945, and his second marriage in 1985. Princess Maria Tatiana, daughter of Prince Andrew of Yugoslavia, was baptised there in 1957. In 2013, it was the venue for the memorial service of Princess Margarita of Baden. The psychedelic rock band Hawkwind were formed here in 1969, and eventually bonded and worked with fantasy author Michael Moorcock who was then a resident (and who also lamented the tendency of the band members to show up at odd hours in search of food, alcohol or other drugs). The Deviants (formerly the Social Deviants) and Pink Fairies were musical groups out of the Ladbroke Grove UK underground movement, from which a number of bands would emerge, influenced by anarchistic singer/writer Mick Farren. Punk group The Clash also formed locally in 1976. The Roughler magazine emerged in the 1980s and 1990s to chronicle the antics of the more Bohemian residents, including the legendary Portobello Pantos. Ladbroke Grove features as the scene of Van Morrison's 1968 song "Slim Slow Slider" from Astral Weeks, and is mentioned in the 1970s pop hit "One Man Band" by Leo Sayer. The Pulp song "I Spy", from the album Different Class, features the line "your Ladbroke Grove looks turn me on". The Blur song "Fool's Day" also features Ladbroke Grove in its lyrics. The Slits song "Ping Pong Affair" also features Ladbroke Grove in its lyrics. "LDN" by Lily Allen mentions Ladbroke Grove in an overdubbed chorus of London placenames. Killing Joke have released an EP (In Excelsis) that features two mixes of a song called "Ghost Of Ladbroke Grove". The novels of author Michael Moorcock often contain references to Ladbroke Grove, the location being the headquarters of his fictional characters Jerry Cornelius and Colonel Pyat. Grime artist AJ Tracey features Ladbroke Grove in many of his songs, including "Thiago Silva", "Spirit Bomb" , “Ladbroke grove ”and "The Lane". AJ grew to fame with his EP "The Front", 2015, on which he frequently links his music to the area where he grew up.. Also Drill Artist Digga D and the rest of the 1011 man hail from the area. At a site just to the east of the Old Oak Common site, Kensington and Chelsea Council has been pushing for a station at North Kensington / Kensal off Ladbroke Grove and Canal Way, as a turn-back facility will have to be built in the area anyway. Siting it at Kensal Rise, rather than next to Paddington itself, would provide a new station to regenerate the area. Amongst the general public there is a huge amount of support for the project and Mayor Boris Johnson stated that a station would be added if it did not increase Crossrail's overall cost; in response, Kensington and Chelsea Council agreed to underwrite the projected £33 million cost of a Crossrail station, which was received very well by the residents of the Borough. TfL is conducting a feasibility study on the station and the project is backed by National Grid, retailers Sainsbury's and Cath Kidston, and Jenny Jones (Green Party member of the London Assembly). The plans were resurrected by Boris Johnson in 2016. Ladbroke Grove is served by London Buses routes 7, 23, 52, 70, 228, 295, 316, 452 and N7. The nearest station is Ladbroke Grove on the Circle and Hammersmith & City lines. Rita Ora, British singer / songwriter grew up in Ladbroke Grove. Hugh Thomas, historian, 29 Ladbroke Grove. Lowkey, British-Iraqi Hip hop artist and political activist. ^ Weinreb, Ben; Hibbert, Christopher (1992). The London Encyclopaedia (reprint ed.). Macmillan. p. 454. ^ "Church of Saint Sava". Archived from the original on 10 September 2013. ^ "Duke of Edinburgh visits St Sava's". ^ "Ladbroke Grove Station (street view, 153 Ladbroke Grove)". Google Maps. April 2012. Retrieved 16 June 2017. ^ Bloomfield, Ruth (24 August 2010). "Study to explore adding Crossrail station at Kensal Rise". Building Design. London. ^ Sebastian Mann (14 March 2016). "Plan for Crossrail station at Ladbroke Grove resurrected | London Evening Standard". Standard.co.uk. Retrieved 16 June 2017. ^ "Who Is Rita Ora?". Complex. ^ "Hayley Atwell: 'Gentlemen swoon but only on set'". The Independent. Retrieved 30 May 2017. ^ Fox, Chloe (17 July 2011). "Action girl: Hayley Atwell interview". The Daily Telegraph. ^ Fox, Chloe (17 July 2011). "Action girl: Hayley Atwell interview". ISSN 0307-1235. Retrieved 1 August 2018. The Sound of Labroke Grove and a long way from Glam!